Guess what!? It’s still the month of chocolate around these parts, so you’re getting hit with another decadent, chocolatey treat today. 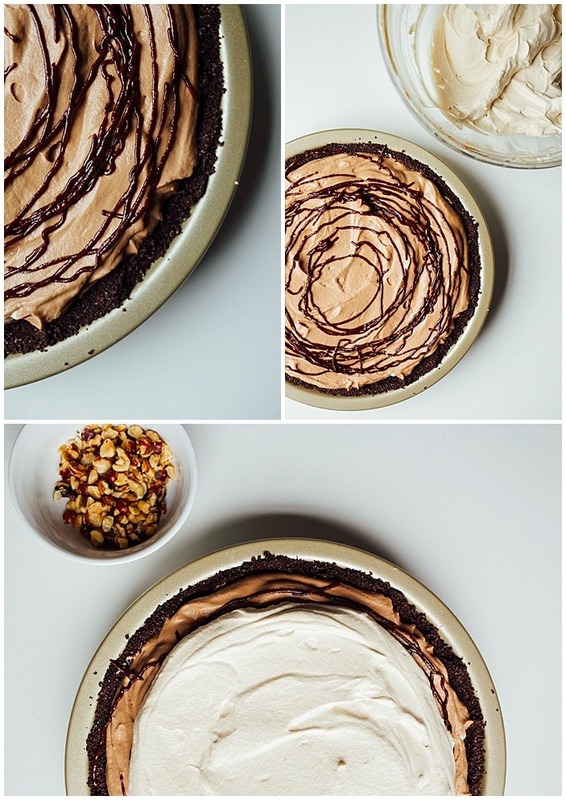 This hazelnut mocha cream pie is a simple, cool and creamy treat that is so good, I think it might make your heart skip a beat. My heart already had its fair share of excitement this week, given that we celebrated Valentine’s Day on Tuesday. Brett and I drove to Birmingham to attend a pop-up dinner hosted by our good friend Mac Russell of Shindigs Catering. Shindigs turns fresh, local food into tastebud spankin’ Southern inspired dishes, and I knew this special dinner wouldn’t disappoint. While there were multiple highlights throughout the six courses of dining, you have to know my heart exploded during the dessert course: tiramisu with Nutella coffee. Even just typing the words makes my mouth water. Lucky for me, I get a coffee and Nutella fix with this week’s #monthofchocolate dessert. 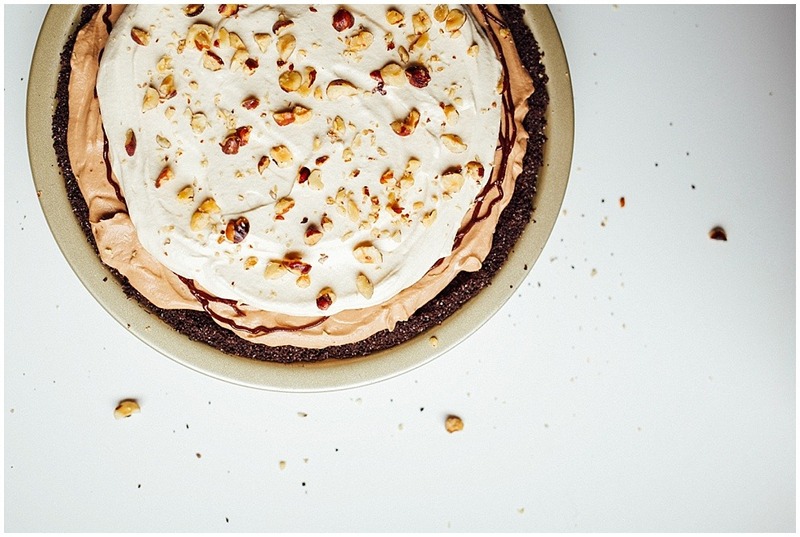 This hazelnut mocha cream pie is officially my new BFF. A cinch to make and inspired by my favorite peanut butter pie, this little fancy has a chocolate graham cracker crust, a hazelnut and espresso cream cheese filling, and is all topped off with espresso whipped cream and crunchy toasted hazelnuts. 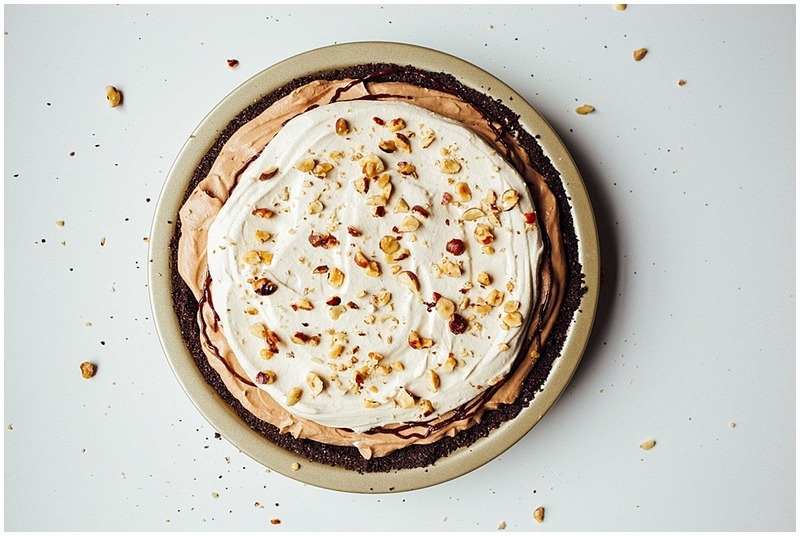 This pie is cloud-like with layers of fluffy whipped filling, and the rich, creamy flavors of the chocolate hazelnut spread is offset perfectly by the tangy cream cheese and bite from the espresso. To whip up this pie, we start with a quick bake of the chocolate graham cracker crust. You can skip this part and go straight for a store-bought chocolate cookie crust, but it’s so easy to whip one up- why bother!? While the crust cools, we beat together cream cheese, Nutella, and a bit of sugar, and then fold in some whipped cream that we’ve already dissolved a bit of espresso in. The filling gets topped with a few more dollops of espresso whipped cream, a drizzle more of Nutella, and some toasted hazelnuts before chilling to completion in the fridge. Hazelnut mocha cream pie takes less than 30 minutes to prepare from start to finish, but you wouldn’t believe it by the taste or looks of it. This pie is easy to beautify and even easier to love, as the coffee and Nutella flavors are a favorite to most these days. You can try different variations of this pie by omitting the espresso, using a pastry crust instead of a cookie crust, or even by opting for cookie butter or peanut butter chocolate spread in place of the Nutella. I love testing out different versions of this pie as it almost always turns out rich, fluffy, and sweetened to perfection. 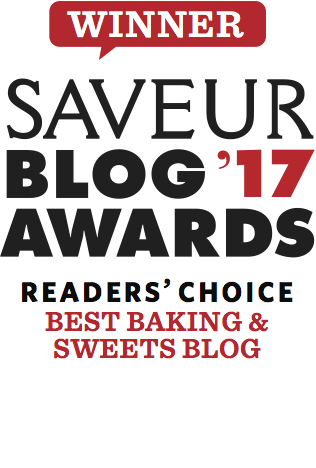 If you try out any versions that are especially delicious, let me know in the comments section below! 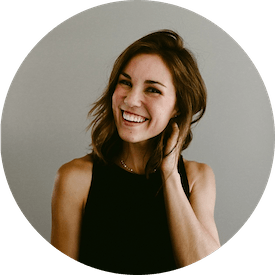 Next week is a super special week for me, as it will be my one year blogiversary! I could not be more thrilled to celebrate a year writing to you all, and I have just the thing to celebrate with. 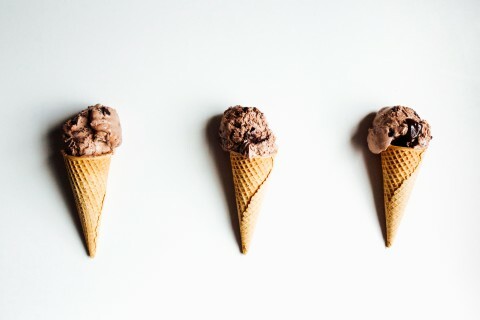 (Hint: it has to do with chocolate. Shocking, right?) Stay tuned until next week and have a terrific Thursday! Cheers to you! 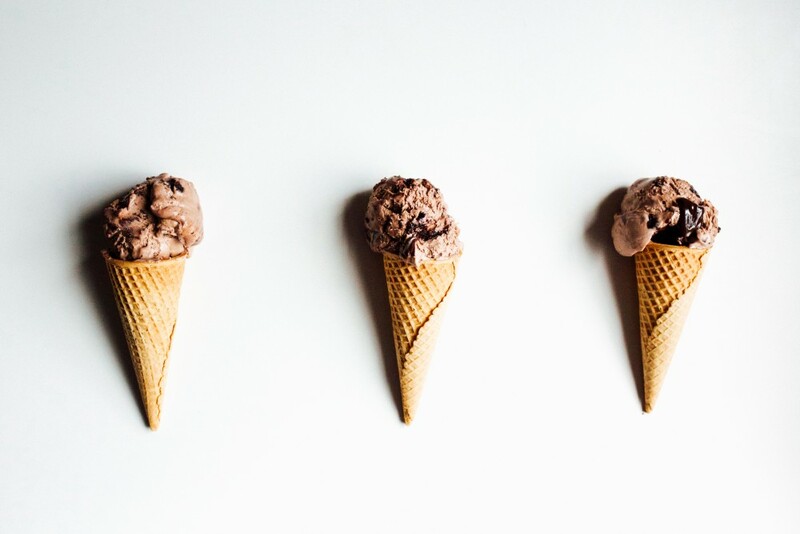 For another mocha treat, check out this no churn mocha brownie fudge ice cream. 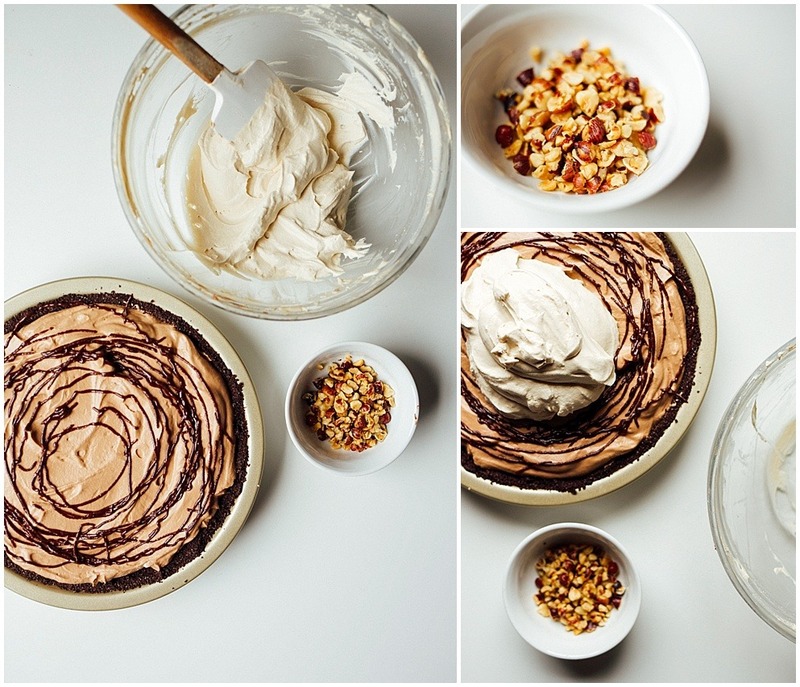 This hazelnut mocha cream pie is a light and creamy icebox pie flavored with Nutella and espresso. A chocolate cookie crust and coffee whipped cream makes this pie a sweet treat to feed a crowd! Preheat the oven to 375 degress. Stir all of the crust ingredients together in a bowl, or whiz together in a food processor. Press the crumbs into the bottom and up the sides of a standard 9″ pie plate (note: this recipe will not fill a deep dish pie pan- use the standard sized pan). Bake in the preheated oven for 7 minutes or until the crumbs are set. Set aside to cool completely. Combine the heavy cream and espresso powder to allow the powder to dissolve while you prepare the filling. In a large bowl or the bowl of a stand mixer, beat the cream cheese, hazelnut spread, and confectioner’s sugar on medium speed until smooth and creamy, about 2 minutes. In a separate medium sized bowl, beat the espresso and cream mixture on low speed until the cream froths. Increase the speed to medium-high, adding the granulated sugar once soft peaks form. Continuing beating just until stiff peaks form. Fold half of the whipped cream mixture into the cream cheese mixture. Once combined, fold in the remaining whipped cream. Spread the filling into the cooled pie crust. Combine 1 cup of the heavy cream and the espresso powder and allow the powder to dissolve, just as you did before. Once dissolved, whip until stiff peaks form, adding the sugar again at the soft peak stage. Spread the coffee whipped cream on top of the pie filling. If desired, combine the hazelnut spread and 1 teaspoon of cream in a small bowl and then microwave for 8-10 second to melt. Drizzle all over the pie as a garnish and top with the optional toasted hazelnuts. Be sure your cream cheese is room temp, otherwise you will have cream cheese clumps in your pie! In a pinch, I slice my cream cheese up into 1 ounce slices and microwave briefly for 10-15 second intervals until it is soft enough. Take care not to cook the cream cheese in the microwave. Espresso powder can be found in the coffee aisle of the grocery store. A high quality instant coffee can be used as well. To toast hazelnuts, put the nuts in a small fry pan over medium low heat. Toss them occasionally. Nuts are toasted when they become fragrant and lightly golden brown. I’ve never tried it! I don’t think the whipped cream would do so hot but the other parts of the pie may do fine! Hi Kate! This looks so amazing! Can you please tell me the approximate weight of the graham crackers used? I made this for Christmas and, while yummy, the filling needs a thickener, maybe gelatin dissolved into the cream before whipping. Even after chilling for several hours, the filling did not hold up, and oozed right out when sliced. hey heather! I’m sorry you didn’t have much luck with this recipe. it sounds like the cream wasn’t beat to the right consistency, although it’s hard to say for sure without having been there. I hope you’ll give this another try and let me know how it works out. I’d love to troubleshoot with you if you need help! 🙂 happy new year!